Hours and hours of scrolling every day makes your life like a robot or a zombie! Have you ever considered doing something better than wondering around on social media in your spare time? 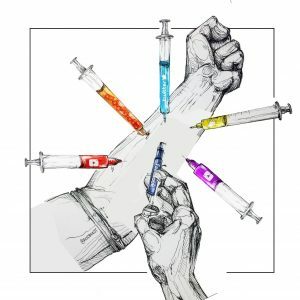 New researches show that social media is being seriously addictive and can be harmful especially to teenagers. Most of the Instagram users are teenagers and young people so it can be the most addictive social media above all. There are benefits of using social media like interacting with other people around the world, the educational and business opportunities, and let’s face it, it’s delightful and fun! It can be really addictive, especially Instagram cause it’s more comfortable to use and you can quickly lose yourself in the explore pages. You can lose track of time while scrolling, therefore overusing social media can waste your time. Seriously, these minutes are more precious than we think. 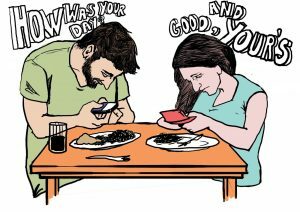 By consistently using your phone, you will get distant from the real world and people who are important in your life, like your parents and your family. Social media is one of the causes of ADHD ( attention-deficit hyperactivity disorder) for teens. Teenagers with this disorder are: overly active, can’t pay attention, daydream a lot, forgetfulness, acting without thinking, etc. Overusing social media will psychological issues like low self-esteem, cause anxiety, and depression. The key is to spend fewer hours a day on social media like Facebook and Instagram to stay healthy and happy. But it can be too hard, you may lose track of time while scrolling on Instagram. These platforms needed new changes to decrease the negative side effects. That’s why Instagram and Facebook have released a new feature for time management. It has a dashboard that shows you the amount of time you spend on Instagram each day. It calculates the average time that you were active on Instagram per week, month or year. This can be very shocking to you, finding out that you are 10 hours on Instagram every day! You can set a certain amount of time for yourself to spend on Instagram. For example 2 hours per day. You can set a reminder which alerts you after a specific time that you have chosen. To bring you back to yourself. You can mute in-app notifications for a certain amount that you want to be away from your social account from 15 mins to 8 hours. To start using this feature, you should update your Instagram app to the latest version. Go to app store/ google play, update your Instagram to the latest version. Go to the home page of your Instagram profile. Tap on the gear icon (setting). It will show you a dashboard with the amount of time you are spending on Instagram each day. And an average hour spent on Instagram for several days. You can tap any bar to see your total time for that day. 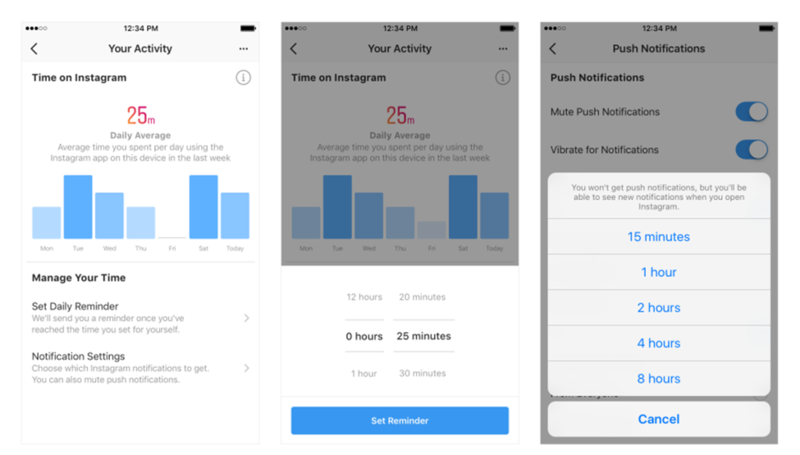 Now you can set a reminder (daily reminder) to give an alert when you’ve reached the amount of time you wanted to spend on Instagram. Note! You can turn off or change the reminder any time you want. Note! You can choose a number from 15 min to 8 hours. 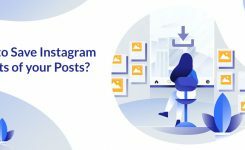 It will show you a dashboard with the amount of time you are spending on Facebook each day And an average hour spent on Instagram for several days. You can click on any bar to see your total time for that day. 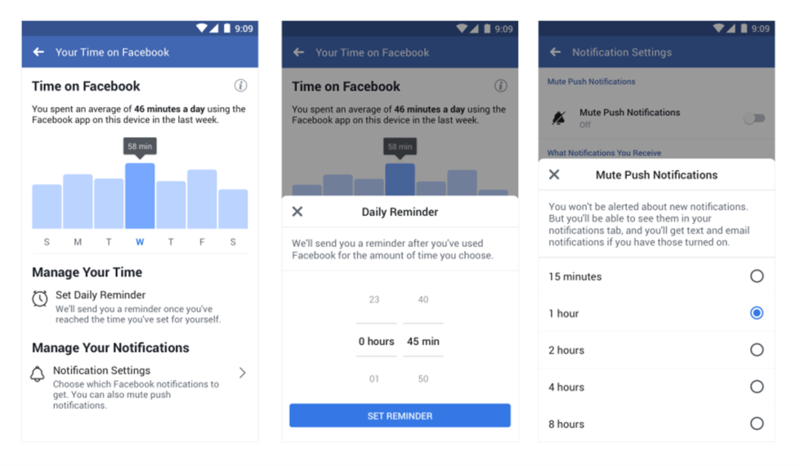 Now you can set a reminder (daily reminder) to give an alert when you’ve reached the amount of time you wanted to spend on Facebook. 7. You can click on “Notification Settings” to get to the new “Mute Push Notifications” setting. This way you can limit your Facebook notifications for a period of time when you need to be away from Facebook. How much time can I spend on Instagram and Facebook? The time you should spend on social media depends on the type of your social activities, personal or business? If you have a personal account, mainly your activities must be interacting with your friends, wondering around celebrity pages or reading quotes, memes and watching vines. Right? This way you should try to spend less than 2 hours on these activities. If you have a business account for your brand or service on Instagram. Or if you are an influencer on Instagram, you are making money from Instagram. So your activities are much more time-consuming. You need to grow your account, post regularly, interact with your customers and be active 24/7. Ok, you are making money from it, but still, it is not healthy! It will have all the adverse side effects for you too. So I can recommend a way to you that can help you a lot. You can automate your Instagram activities and just sit back and enjoy your account grow! Instagram bots: these bots will automate your interactions with other users. They will auto like, auto comment and auto follow other users like a real person ( randomly). So the people will get curious and check you out and follow you. Some of these Instagram bots like Instazood let you choose targets for the followers you want to gain. 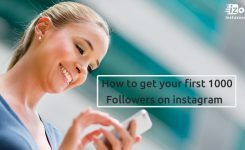 It means you can select a target on usernames, hashtags, locations, and the Instagram bot will increase followers and engagement from your targets. Schedule posts: you can schedule your posts, and the platform will automatically post your content on the time you want. Note! 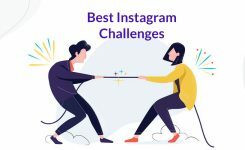 You can use Instagram bots which have schedule posts and get to a win-win situation. 3. Auto direct messages: you can automatically send direct messages to all or some of your followers like welcome messages, introductions of new products, events, etc. this way you can save a lot of time. By Instagram automation, you can free your time for your family and not have to bring your work at home too. Social media is a powerful tool that helps you a lot to get socialize, but if you use it right and not too much or it will make you a big antisocial robot/vampire who is afraid to interact people on the real world! You can use this new tool that Instagram has released and use the extra time to do a more beneficial activity like going out with friends, hanging out with your family, reading a book, etc. Hope you find this helpful. If you have anything to share with us, feel free to add a comment below.